For any sea anglers reading this article that are not familiar with Belfast Lough, the Maidens are a group of nine islands of varying size, that lie approximately six miles offshore from Larne harbour. Also known as the Hulin Rocks, the two main islands stand proud on the horizon and are easily visible from the coast road. My earliest angling experience in this area was many years ago, aboard the well-known angling vessel “The Missy Moo”, owned and chartered by Tommy Martin, an experienced and knowledgeable skipper operating out of Bangor. In those early days, my own sea angling skills were limited, but with Tom’s help and advice, we managed many fine catches, including double figure Pollack, specimen Ling and huge Cuckoo Wrasse. It is fair to say that the angling quality dramatically declined since those early adventures, which led me to travel further a field, but I have often thought about a return trip to this area in my own boat in search of those large, hard fighting Pollack and deep water Ling. Eventually, however, it took a phone call from my angling mate, big Phil, to set the wheels in motion. He recently rang me on a Saturday night having just returned from a days sport at the Maidens, and delighted in recounting the day’s events he and his mate George had experienced, with numerous Pollack to eight pounds, specimen Cuckoo Wrasse and a bonus Tope of fifty three pounds, taken, incredibly, on a set of baited Mackerel feathers. He had planned to set out again the following day and asked if I would fancy tagging along. When it comes to angling invitations, the word “no” is not in my vocabulary, so the following morning we arrived at Ballylumford Harbour. This is the nearest, safe launching slip for access to the Maidens. There is no charge to launch (unusual for the North, and a welcome change) and there are also excellent toilet facilities with hot and cold running water. Phil’s recently acquired Del Quay Dory is quite easily launched, and while I parked the jeep and trailer, he took the boat for a quick run around the harbour to see how she responded with the newly fitted seventy five horse power Mercury outboard. She certainly looked the part, and I could hardly wait to get out on the water for another sea adventure. There is no doubt about it, Dory’s are excellent small angling boats, and she literally skipped across the waves in excess of thirty five knots, en route to the two large islands ahead. Despite modern electronics, it is vital to keep a keen eye forward, and today was no exception. I pointed out an object ahead that appeared to be a rock, and as we pulled alongside, it turned out to be a huge, upturned tree stump, about the size of a small car! I dread to think the damage it may have caused if we had struck it. Any hazardous objects such as this should always be reported to the local coast guard, giving a description and co-ordinates of its location if possible. The islands are quite impressive at close range, and support a wealth of bird life including Guillemots, Razorbills and Cormorants, along with a large resident seal population. It did not take long to discover the shoals of Mackerel below the feeding sea birds and we soon had enough fresh bait for the day ahead. The territory below the surface is extremely tackle hungry. Kelp beds, rocky pinnacles and crevices, combined with strong tidal currents and over falls can make short work of expensive boat rigs, so to keep tackle losses to a minimum, hooks that eventually bend under pressure, slightly lighter snoods, and “rotten bottom” weak links to the lead sinker were all used to good effect. It is these types of inhospitable venues that tend to turn up spectacular catches, so you must be prepared to lose some amount of tackle from time to time. I decided to target the smaller species to begin with, and soon had beautifully marked Cuckoo Wrasse queuing up to be caught, a species that once put the Maidens on the angling map, from the specimen hunters perspective. These were interspersed with decent Ballans around the three-pound mark, all taken on Mackerel strip. I know that a few more Ballans would have shown had we brought some ragworm with us. We tried many areas around the islands and caught Pollack, Coalfish, Codling and Scad, along with the ever present Cuckoo Wrasse, a few of which nudged the specimen weight, but unfortunately did not quite manage to surpass it. We finished off with a drift for Tope that ended fruitless, but none the less, it was a busy, enjoyable day, and we headed back to the harbour, determined on a return trip as soon as possible with a bid to un-lock any further secrets these islands and the surrounding waters may hold. The following week raged with gale force winds, but thankfully, they relented by Sunday, allowing the sea to flatten out sufficiently, that we may venture back for another look at the Maidens. On this occasion, I accompanied Phil in my own boat. The winds have been so bad this winter, I had almost forgotten what my Red Bay Fast Fisher looked like, and she was in desperate need of a good run to blow the cobwebs off! My long time angling pal, Dessy Young joined me, along with Mark, my younger brother and new budding angler. On the way out, we stopped amongst a huge gathering of Guillemots and Razorbills, gorging themselves on Herring fry, in the hope of finding some late season Mackerel, but instead, caught large Scad, also known as Horse Mackerel. These are a silver, shoaling, deep-water fish, and although not as effective as Mackerel, they are a reasonable substitute when bait is scarce. As the day progressed, it turned out as a carbon copy of the previous trip. Plenty of beautifully marked Cuckoo Wrasse, the males in stunning blue and orange hues, and the females in a subtle peach or pink. Ballans, Coalfish and Codling also made an appearance, nothing large, but in plentiful numbers to keep us interested. 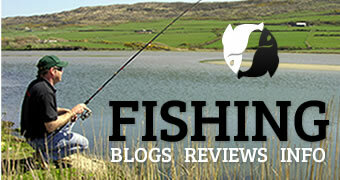 Mark took a decent Cod that put up a great fight on light gear, which really made his day. We decided to try a mark east of the north rock, known as the Highland Perch, which proved to be a wise decision. This is a small peak that breaks the surface from over two hundred feet below, and with strong tides and bubbling over-falls, it can only be described as a “witches cauldron” that positively screams of Pollack. Again, no double figure fish, but no shortage of Pollack to five pounds willing to scrap hard on light tackle. As the light began to fade, we decided to pack up and head for the harbour, busily discussing how much we had enjoyed the day, whilst the cabin was bathed in a crimson glow from the stunning sunset laid out before us. It sounds corny but it is trips like this that you realise, the act of catching a fish is simply a bonus. To sum up, although no large fish were taken, I thoroughly enjoyed my two, recent Maiden Island adventures and firmly believe that there is great potential for the spectacular, which warrants further investigation. To keep the “buzz” going, I took a look on the Internet and was amazed to find information and G.P.S co-ordinates on thirty-seven large shipwrecks in and around the immediate area of the Maidens. Not surprisingly, I cannot wait to get back out there and hunt out some of these wrecks, perhaps anchoring in search of Ling and Conger. Maybe this is the key that will unlock some of the islands hidden angling treasures. Of the group of nine rocks, the two largest would be more accurately described as islands. The western island is known locally as the North Rock, and the eastern island is known as the South Rock. Both islands had active lighthouses until 1903, when the North Rock light was abandoned. In 1977, the South Rock light was automated and modernised to electric. There are several landing points on both islands, including stone steps, but strong tides and heavy seas can make this a dangerous task and is un-advisable. Ballylumford Harbour has excellent launching facilities for the private dinghy angler, at any state of the tide, with large car parking for vehicles and trailers. As this is a major ferry port, care must be taken at all times when entering or leaving the harbour, but with good seamanship and common sense, there should be no cause for concern. From Belfast, follow the M2 motorway signposted to Carrickfergus, then carry on out towards Larne. At the Ballycarry junction, turn right, over the road bridge and onto Islandmagee. The next left will take you to Browns Bay, where signposts will direct you to Ballylumford.